The Puente Nuevo, meaning the New Bridge in Spanish, spans the El Tajo Gorge and the Rio Guadalevin river within the town of Ronda in the gorgeous Costa del Sol region of Malaga. This is located in Andalusia in Spain. The Puente Nuevo, built in 1793 after 40 years of construction, crosses the river Guadalevin and the El Tajo Gorge in Ronda in the Costa del Sol in the province of Malaga, Andalusia, Spain. When the bridge was first being built, 50 construction workers died when the bridge collapsed, and that is why construction took so long to complete. The bridge divides the town of Ronda into the new town and the old town and was actually built to replace a previous bridge built in the 16th century, as it was just too steep. That bridge sat on top of a 12th century Moorish bridge, and those foundations are now a museum for the prison and the previous bridges that also sat on that spot. Photo of the Puente Nuevo (New Bridge), in the town of Ronda, Costa del Sol, Province of Malaga, Andalusia, Spain, Europe. ... It is built solidly of stone and contains a number of arches to help distribute weight more evenly along the bridge. Due to the amazing height of the bridge it is unfortunately a magnet for suicides and accidents today and both have been common throughout its history. 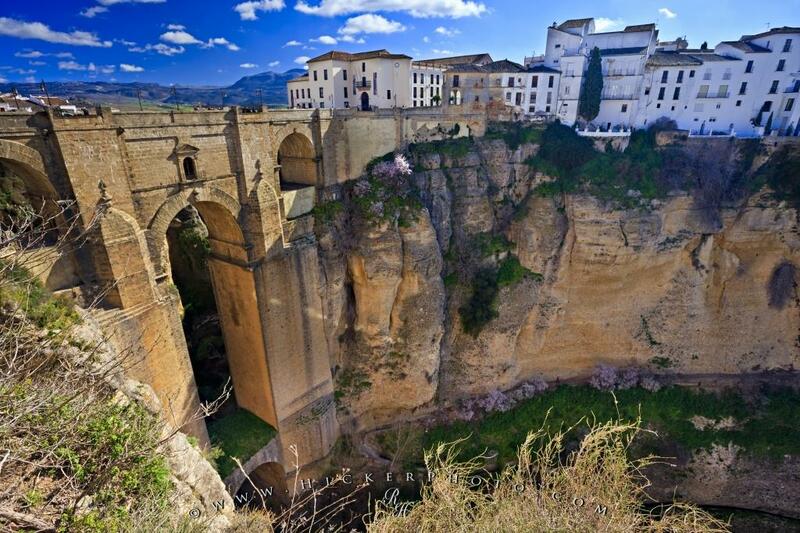 Puente Nuevo (New Bridge) spanning the El Tajo Gorge and Rio Guadalevin (River) in the town of Ronda, Costa del Sol, Province of Malaga, Andalusia (Andalucia), Spain, Europe. I photographed this photo with the digital SLR camera model Canon EOS-1Ds Mark III, aperture of f/6.3, exposure time of 1/80 sec. on ISO 100, as always I used a original Canon Lens, the focus lenght for this picture was 18mm.